According to Jet Magazine, 26-year old Ruth Taylor from New York City was the first African American hired to be a flight attendant in January 1958. 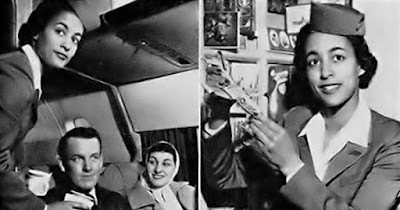 She worked for Mohawk Airlines, a regional passenger airline that operated in the Mid-Atlantic region of the U.S. from the mid-1940's until its acquisition by Allegheny Airlines in 1972. Later on, more and more Black flight attendants were hired by bigger airlines. For example, Patricia Murphy, a Chicago native, was the first African American flight attendant for Delta Air Lines. She was hired in 1966, and many others followed including Casey Grant, who worked in the airline industry for almost 35 years. Grant even wrote a book about her experience called Stars in the Sky: Stories of the First African American Flight Attendants, which gives some insight into their daily encounters of racism such as being denied access to the cockpit because her kind was not allowed. In stories about aviation history, those of the first African American stewardesses were left untold. They took to the skies when flying was glamorous and exclusive, when little girls dreamt of being stewardesses, models, or movie stars. They rubbed elbows with the elite and traveled the world when few others could. They flew as pioneers long before the time of the Internet and globalization. They also kept their heads high, facing down racial prejudice and discrimination. They lived as stars in the sky.